The Uncurated Life: Paymaya Shares The Love this Holiday with their Rebates and Rewards! 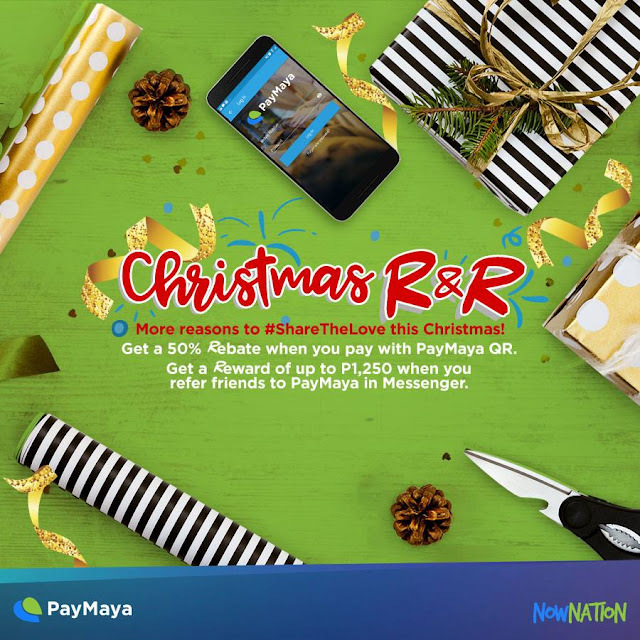 Paymaya Shares The Love this Holiday with their Rebates and Rewards! There's nothing like getting a good deal and lots of fun surprises this holiday season I've been a Paymaya user for more than a year now. It all started when I wanted use a credit card payment option for Uber but didn't want to use a regular credit card. When it worked, it evolved to me using Paymaya for booking hotel staycations, paying for my bills, using it as a way for people to pay me and sending loads to our helper. It also evolved to me using it for cashless transactions with the physical card being Visa-powered that enables me to use it for shopping and dining. This Christmas, Payamaya account holders have more reasons to #ShareTheLove this Christmas as it announced today its Christmas Rebates and Rewards (R&R) promo! This allows its users to earn 50% rebate on payments made via PayMaya QR!! plus an opportunity to earn P50 for every referral to PayMaya in Facebook Messenger. Which by I've already earned because some of my friends joined in!